When I made these blueberry beignets the other day, Benjamin told me that "they were like pillows you eat or balloons that don't pop." Scooped by my own four-year-old son. Because friend, he was wholly, completely, absolutely right. They were like balloons - dough that is stretched and thin at its exterior and full of moist, air-pocketed crumb at their middle. Light for their size, pillows made of flour and sugar rather than feathers, but just as downy. If you dust them with sugar while they're still a warm, that sugar will melt and turn to a thin glaze, shattering delicately on the tongue and dissolving almost immediately. Ethereally sweet. And then if you dust them again with sugar, once that first glaze is set, then there's a dusty, pure-white flurry of powder to decorate your lips as you bite into the crust. As they cool, the centres firm up and the texture is developed, the structure of the open crumb giving a slight, gratifying resistance to the tooth. Then of course there are those pockets of blueberry that burst and run rivulets of inky juice throughout. A bit Jackson Pollack meets Julia Child. Consider these the elevated incarnation of those powdered doughnuts from the carnival. Which reminds me, the last time we were at the carnival, we forgot to get doughnuts. We had popcorn that tasted exactly like carnival popcorn - vaguely stale even though fresh from the popper, shellacked in a "butter" coating that's oddly granular and awfully salty. And we ate it, all of it, in greedy handfuls that turned our fingers shiny, because that's what one does on a Ferris Wheel, right? But we missed the doughnuts. We must remember to squeeze that in before summer retires - get doughnuts at the fair. It's only habit that has me writing those words in my calendar in red ink with double underline, as these beignets satisfy any deep-fried-sweet-dough-craving that one might harbour. And for the fact that you eat them at your leisure, in your home, fresh from the fryer and with a tummy that's been spared the twirling aftereffects of the Tilt-a-Whirl, they might be even better. From the book, Simply in Season, by local chef Tony de Luca. 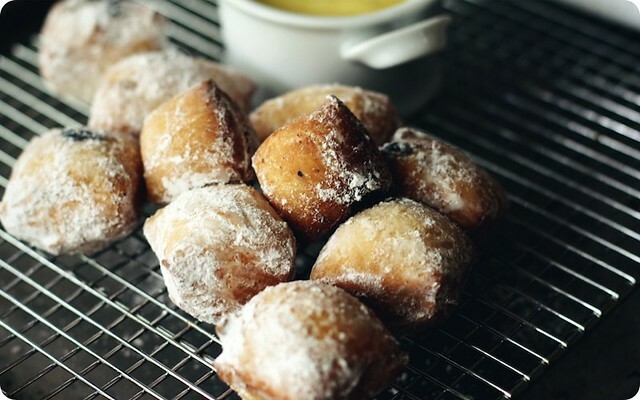 He suggests these fluffy beignets be paired with a cool, softy-tart Sour Cream Panna Cotta. But lacking those, if you happen to have some lemon curd kicking about then by all means follow our lead and serve it alongside. Permission to print recipe courtesy Whitecap Books. In a small bowl, dissolve 2 teaspoons (10 mL) of the granulated sugar in 3/4 cup (185 mL) warm water. Sprinkle in the yeast and let stand for 10 minutes or until the yeast is bubbly. In the bowl of a stand mixer fitted with the paddle attachment, mix together the remaining sugar, the evaporated milk, egg, shortening, and salt. Add the yeast and beat until smooth. Beat in the flour, 1/2 cup (125 mL) at a time, until a soft, sticky dough forms. Stir in the blueberries until just combined. Spray a clean bowl with the baking spray and transfer the dough to the bowl. Cover wih plastic warp and refrigerate for at least 6 hours or overnight. On a lightly floured surface roll out the dough to form a rectangle about 20 x 16 inches (50 x 40 cm) and 1/4 inch (6 mm) thick. Using a sharp chef's knife, cut the dough into squares about 2 1/2 inches (6 cm). Heat the oil in a deep pot until a candy thermometer registers 360°F (182°C), or use a deep fat fryer and follow the manufacturer's instructions. Fry the beignets, a few at a time to avoid overcrowding, for about 2 minutes, turning frequently, until golden brown. Using a slotted spoon, transfer the beignets to a rack lined with papers towels and set over a baking sheet to cool. 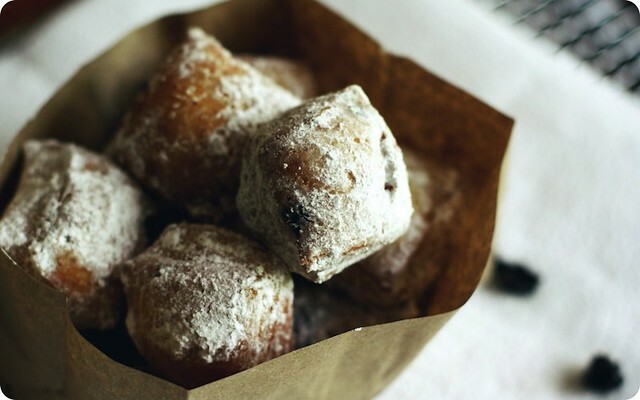 Dust the beignets generously with icing sugar and serve. I added an approximate 1/2 teaspoon grated lemon zest to the dry ingredients, and 1 teaspoon of vanilla extract to the evaporated milk before stirring into the flour mixture. It may have been the weather, or my batch of flour, but I found I used just under 3 cups of flour for my dough to come together to the state described (soft, sticky). I would advise keeping an eye on your dough as too much flour will make a stiff, dry beignet.